Above: Mesoamerican Chocolate Elixir. Photography Eric Swanson. From the "Rhymes with Kapow" article in the February 2018 issue. 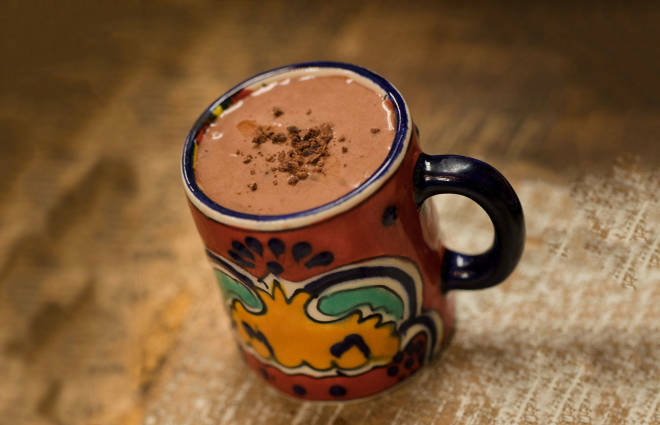 Made with unsweetened chocolate, this complex, rich, and bittersweet drink is nothing like the hot chocolate you’re familiar with, but it’s probably pretty similar to what the Maya would have made more than 1,000 years ago. In a small saucepan, combine the water and annatto and bring it to a simmer. Remove from the heat. Add the chocolate to the hot water and stir until all the chocolate is melted. Using a whisk, mix the ingredients well. Add the honey or agave nectar, chile, vanilla extract, and cacao nibs, stirring to combine. Adjust the spices and sweetener as needed. Mix well and serve hot.